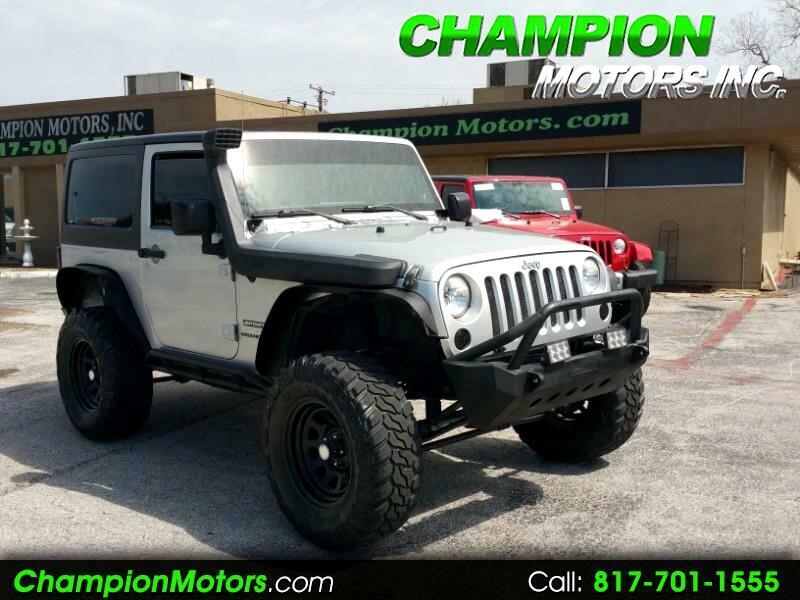 *VEHICLE HISTORY REPORT AVAILABLE UPON REQUEST* *CLEAN/CLEAR TITLE* *LIFTED W/FOX SUSPENSION* *SMITTYBILT XRC BUMPERS AND TIRE CARRIER* *CUSTOM METAL FENDER FLARES* *ROCKER PANEL GUARDS* *OFF ROAD SNORKEL* *AUTOMATIC TRANSMISSION* *COLD A/C* *LOCKING HOOD LOCKS* *LED LIGHTS INSIDE AND OUT* *CUSTOM LIGHTING* *BUILT IN AIR COMPRESSOR* *PIONEER BLUE TOOTH STEREO* *TOO MUCH TO LIST* *FULLY SERVICED AND MULTI-POINT INSPECTION COMPLETED AT THE NEW CAR DEALERSHIP* *HARD TOP* TINTED WINDOWS* *NO HAGGLE NO HASSLE BARGAIN PRICING* NEED FINANCING? WE OFFER BANK, CREDIT UNION, SECOND CHANCE, AND IN-HOUSE FINANCING. INTERNET PRICES DO NOT APPLY TO THOSE IN NEED OF SECOND CHANCE OR IN-HOUSE FINANCING. ZERO DOWN FOR WELL QUALIFIED BUYERS. EXTENDED COMPREHENSIVE WARRANTY AVAILABLE FOR PURCHASE. GO TO WWW.CHAMPIONMOTORS.COM TO VIEW PICTURES AND APPLY FOR FINANCING. BRING A COPY OF AD TO GET INTERNET SPECIAL PRICE. FOR BETTER SERVICE SO YOU DON'T HAVE TO WAIT, PLEASE CALL TO MAKE AN APPOINTMENT. ALL INTERNET PRICES OFFERED, ARE FOR CASH BUYERS AND ARE SUBJECT TO CHANGE OR REMOVED WITHOUT NOTICE UNLESS A DEPOSIT IS LEFT TO HOLD. All advertised prices exclude government fees and taxes, any finance charges, any dealer document preparation charge, and any emission testing charge. The price for listed vehicles as equipped does not include charges such as: License, Title, Registration Fees, State or Local Taxes, Dealer Prep, Smog Fees, Credit Investigation, Optional Credit Insurance, Physical Damage of Liability Insurance, or Delivery Fees. DEALER makes no representations, expressed or implied, to any actual or prospective purchaser or owner of this vehicle as to the existence, ownership, accuracy, description or condition of the listed vehicle's equipment, accessories, price, specials or any warranties. Any and all differences must be addressed prior to the sale of this vehicle. EPA mileage estimates for comparison purposes only. Actual mileage may vary depending on driving conditions, driving habits, and vehicle maintenance.